A tired trope in Western storytelling places science, and the idea of a mechanical universe with no conscious oversight, in opposition to spiritual belief, and the idea of a universe governed by an ostensibly loving authority. But Yorgos Lanthimos, director of 2015’s critically acclaimed, absurdist dystopia, The Lobster, is by no means a tired storyteller. 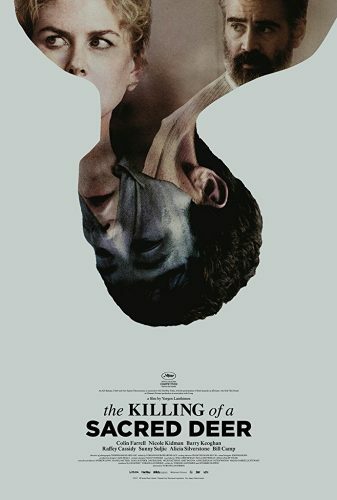 In his latest, The Killing of a Sacred Deer (2017), one clockwork universe is instead pitted against another clockwork universe, in the context of a brutally prolonged trolley problem. The only saving grace here is the knowledge (we hope) that this second, merciless rulebook for morality is not the real world—and yet, it comes just close enough to exhort viewers to move through our own with better care. Lanthimos prepares us for this suspenseful descent into existential horror with a highly unusual opening shot, taken from an act of real-life open-heart surgery attended by members of the production. In this pulsing morass of human flesh lies the central tension of the film: the fragile belief that we can ever fully decide where life stops and starts, and which of our actions in the universe will yield consequences far beyond our control. If this image of the heart literally laid bare seems strange, provocative, or discomfiting, it nevertheless proves a mild aperitif next to the inner convictions exposed and tested over the rest of this uncanny film. The game is established by the co-writing team of Lanthimos and Efthymis Filippou with what looks to be a benevolent and fairly mundane relationship: a middle-aged man, Steven Murphy (Colin Farrell), adopts a fatherly role in the life of Martin (Barry Keoghan), a teenager who lost his father on the operating table. Steven has a wonderful existence: a successful career as a cardiothoracic surgeon; a wife, Anna (Nicole Kidman), who role-plays catatonic patients for his sexual gratification; and two children, Kim (Raffey Cassidy) and Bob (Sunny Suljic), who express fairly typical childhood anxieties about household status, chores, and creative practice. But as the film ticks on, like the hearts and watches and pointedly mechanical dialogue advanced within it, Martin’s presence gains—at first—a familiar pathology. After insinuating himself into our protagonist’s routines, he tries to get Steven to take up an, ah, active role in his widowed mother’s life, and it becomes clear that Steven has not been entirely forthcoming with his family about Martin’s existence. If the film had stopped with these twinned tensions, a highly compelling drama would still have unfolded … but Martin is not simply an ineptly grieving teenager: he knows something. He carries something within him. He has the power to change the laws of nature necessary to demand retributive sacrifice on Steven’s part. As such, when the time for that cosmic justice arrives, it involves (as Martin quickly, politely explains in the hospital cafeteria to Steven) four stages of suffering. First Steven’s family members will refuse to eat. Then they will lose the ability to walk. Then they will bleed from their eyes. Then they will die. So the course of justice will proceed, until Steven chooses which of his family members to kill, to balance out the loss of Martin’s father in the eyes of the universe. There is, of course, a gradual reveal that suggests clear cause for this eye-for-an-eye mentality: Martin’s father died from a botched surgery, and the film delicately closes in on the culprit as the horror escalates. However, there is also an air of irrelevance about who actually committed this fatal act, and in what state of mind. What matters more, by the rules of this film’s alternate morality, is simply that it happened, someone died, and now Martin’s life is lesser while Steven’s life is not. Wavering on this knifepoint of “legitimate” and “illegitimate” senses of cosmic justice, The Killing of a Sacred Deer questions the value of these terms next to the sheer horror of retribution when, for whatever reason, it rears its monstrous head. Could anything Steven might have done be seen to merit what happens next? What makes Martin an exceptionally memorable agent for this terrifying sense of justice is his utter banality. His surface-level passivity in the film’s events extends to talking calmly, in the midst of this family’s nightmare, about tangential affairs while eating spaghetti, and then treating as a matter of course Steven’s later, futile violence against him. In the apologetic manner with which he approaches much of the monstrosity that unfolds, Martin becomes a spectre of passivity that compels Steven to carry the full, active weight of retributive justice on his own shoulders. Even Kafka’s Josef K, allowing himself to be led by a heinous bureaucratic evil from freedom to the execution hall in The Trial, “forces” his executioners to become active participants in the final act—but not even this much freedom is available to Steven under Martin’s passive watch. Martin also has the capacity to achieve horrific ends at a distance, without directly touching or poisoning or otherwise affecting the material realm; this drives Steven to despairing, even cruel actions towards his youngest child, when Bob loses the ability to walk and all of the good doctor’s scientific resources cannot determine why. As a teenager himself, however, Martin is also imbued with a touch of entirely self-serving “benevolence,” which manifests itself in how Martin prepares Kim (in whom he has a keen interest, and who in turn is very proud to play rebel to her mother and align herself with Martin’s ideals) for her ordeal, reviving her ability to walk just long enough for them to share a moment at the window of her hospital room. Meanwhile, as Anna and the children come to recognize that Steven will have to make a choice in response to all these horrors, their interactions—in the same matter-of-fact register that has framed their family dynamic from the outset—become excruciating exercises in trying to appeal to Steven to spare their lives, and to rationalize to each other why Steven will eventually choose a different relation to kill. As this macabre familial spat progresses, it is less the fact that Steven must make a choice than the fact that he won’t that provides the bulk of torture that unfolds. When the universe has decided to favour a grieving teenager’s sense of injustice over the usual freedom from consequence that so many persons in positions of wealth enjoy, then the real horror lies more in dragging out this verdict. And yet, as Anna’s earlier sexual role-play indicates, Steven has moved through life expecting minimal reactive agency from those around him—in large part because, until Martin’s arrival, those closest to him sustained this untenable illusion of complete, rational control for years. Herein lies the thread of culpability that suggests why Anna should also have to endure this horror as a consequence (ostensibly) Steven’s possible surgical mistake. The children are another matter, “sacred deer” in all their parents’ choices, but in this filmic universe Bob and Kim are given their own moments of resistance and agency, instead of being mere passive elements in Steven’s narrative. This facet of Lanthimos and Filippou’s storytelling accentuates the abiding sense of tragedy that emerges when justice—Martin’s sense of it, at least—is eventually achieved. When Steven finally gives in, making his choice with as much randomness as he can manage, there is no grand catharsis in the act, let alone a sense of moral clarity. There is only the clear sense that it is done, and that the wretched weight of retributive justice has moved on. But what of the deer itself? Does its life, and death, carry any greater significance than the shifting of the wretched scale to which it was applied? Whether one favours the idea of an utterly indifferent universe, or one in which a loving omnipotence will heal all wounds in time, one thing is certain: After Lanthimos’s latest, thoroughly riveting existential nightmare, both sets of belief will surely seem preferable to a universe in which some unforgiving moral calculus only accepts compensation for past human trespass at an equally egregious human cost. And isn’t it just a pleasure for us all to be on the same side, for once, of this age-old question about human action and its consequences? M. L. Clark is a Canadian immigrant to Medellín, Colombia, and a writer of speculative fiction, reviews, poetry, and cultural essays.